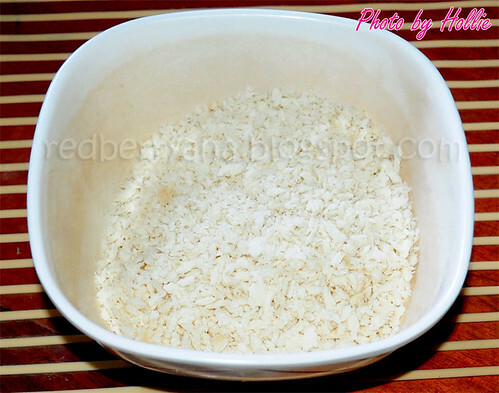 My son loves this stuff and I want to share my recipe to you all hoping you will like it too. This will definitely make a good and healthy recipe for your kiddos. 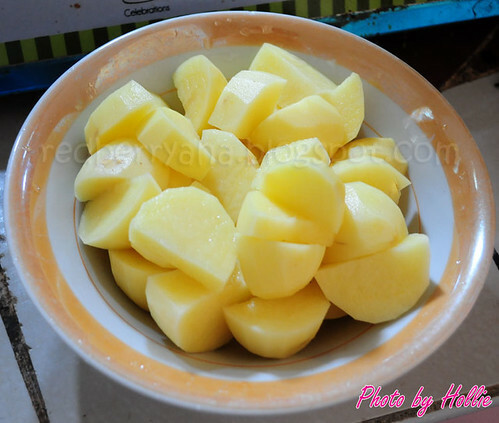 Peel and slice potatoes into chunks. 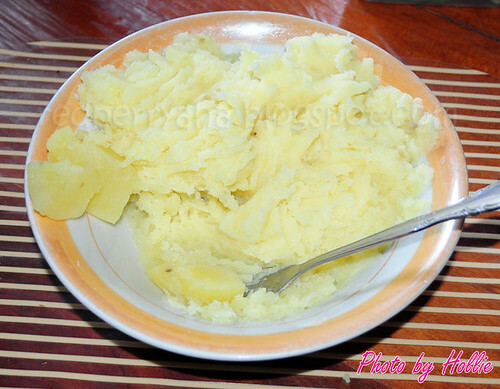 Place potatoes in a pot of water and add 1 tbs of salt. 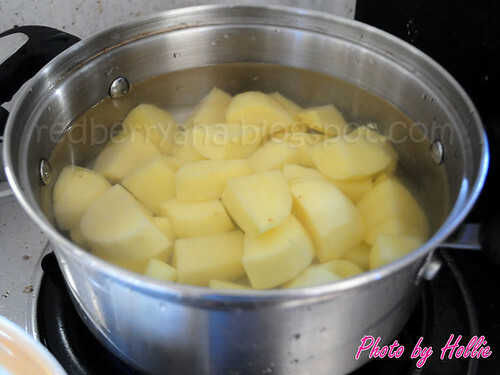 Boil for about 15 minutes until potatoes are soft and easy to mash. Once done, drain water out and place potatoes in a bowl. Mash the potatoes one by one with a fork until done. Prepare at milk and butter. 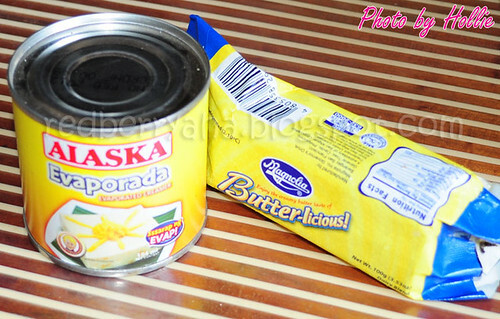 I'm using Alaska Evaporada and Magnolia Butter-licious. 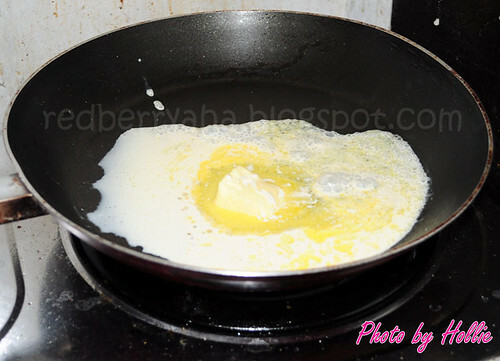 Place about 3 tbs of butter and 3 tbs of milk on to non-sticking pan. Heat on low fire and mix continuously until thick. This usually takes about 30 seconds to finish. Add ground black pepper and salt on mashed potatoes to taste. 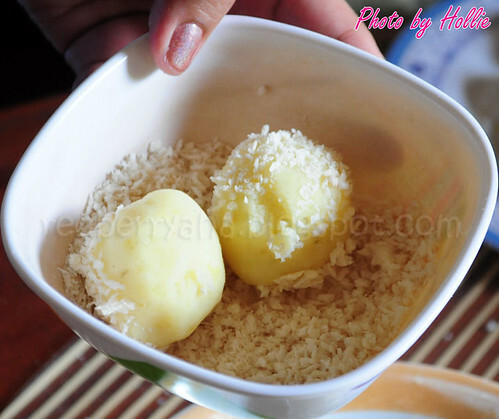 Pour milk and butter mixture to bowl. 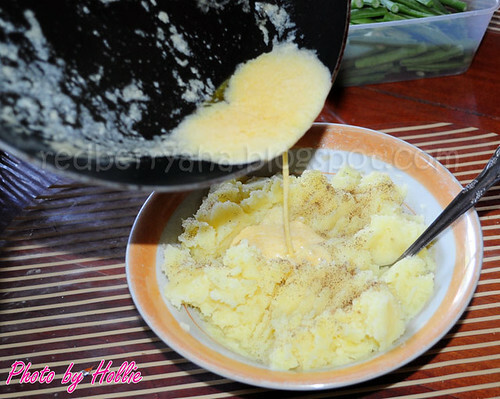 Mix properly until mashed potatoes are fluffy. 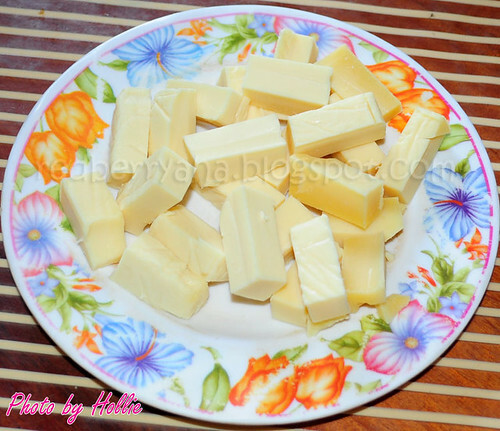 Prepare thick slices of cheddar cheese. 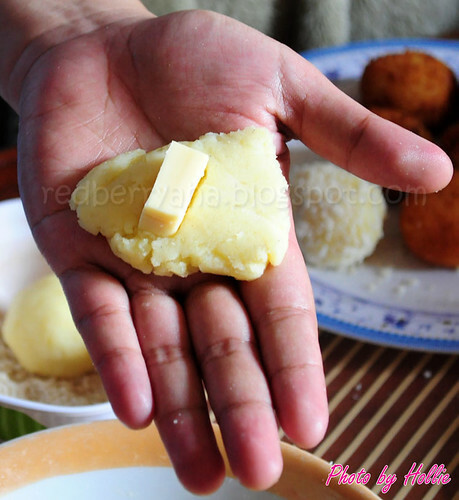 Take about 1 tbs spoon full of mashed potaoes and flatten on your palm. 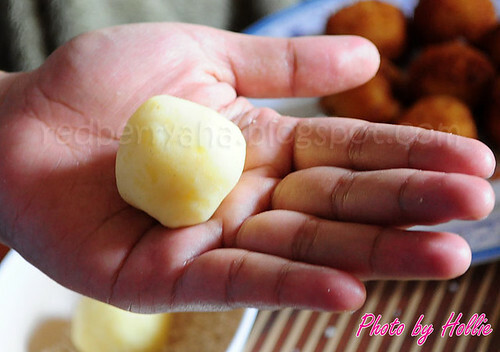 Place sliced cheese on the center of the potato and form into a ball. It should look like this with the cheese inside. 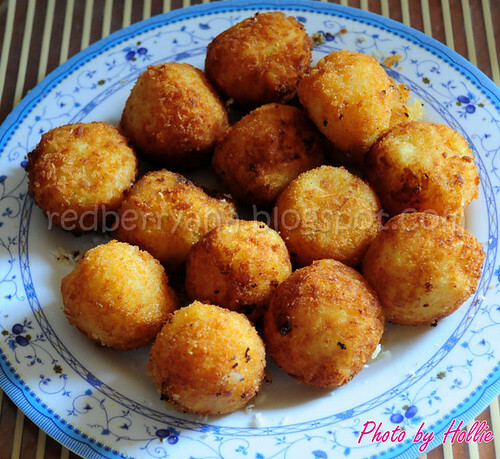 Coat mashed potato balls with breadcrumbs. Make sure that it's completely covered with crumbs. 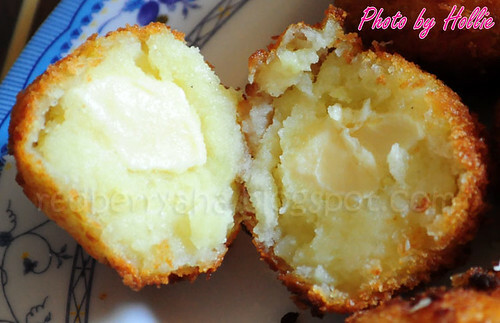 Deep fry potato balls onto hot pan until brown. and your potato croquettes are done. Enjoy! OMG, this is pure evillll. All that carbssss! No Hollie, why???!?!?!??!! Now, I just need to find the ingredients! you made me crave for this! I'll try this for my lil' boy:)thanks for sharing!By the way, Im having a sleek Makeup Limited Edition Collection Giveaways. Would you like to enter? This is open international!Cheers! @maricarljanah, wahahaha! but it's better than rice LOL! @rhaindropz, thanks and you're welcome. @Jackie, hehehe, sure let me know if you liked it. @sugar sugar, thanks you sis! @Fabulous Aimee, I hope your little one likes it too! @Pammy, thanks sis! me too! wow looks really yummy!!! i want to do this for my baby!!! my baby loves potato and cheeese!! OMGGGGGGGG THIS LOOKS SINFULLY GOOD! i'm so going to bookmark this page and try this it looks SO GOOD! @Tiffiefum, thank you deary and yes you should try it! @Diane, Thanks sis! I hope you're little angel will love it. @Myrted, lol, it is... thank you. @Shopcoholic, hihihi, thank you sis! I love potatoes. They're my favorite. I never had them the way you had it made. It sure does look good and very appetizing. Thanks for the recipe, will try to make this tonight.